This large, centrally located apartment can comfortably sleep up to five. Please ask first if you have more than this. Portacots and inflatable mattresses available on request. You will love the apartment because it is spacious and gets afternoon sun in through the many windows into both bedrooms and the living area. The 2 bedrooms are separated by an open plan kitchen and living area with a large 3-seater couch and chaise, and sofa. The lounge seats 8. We hope you enjoy the complimentary Netflix, and Freeview digital TV. You are on the doorstep to restaurants and nightlife, shopping, the waterfront, the public transport hub, museums, convention centre, exhibition centre, and numerous other highlights. It is perfect for business travellers and families as it has full amenities. If you are arriving by car, you are welcome to hire the car park during your stay. It is covered/secure. Please enquire first, as there is a fee for this, and is not always available. Breakfast is provided and all linen is provided free of charge. You will also have fresh fruit, tea and coffee, bread and spreads, and cereals. On arrival, we will meet you at the apartment building, show you in, and hand you the keys, and answer any questions you may have about your stay or Wellington. On request only. May be booked. Charge applies. Please enquire. Covered, secured, ground floor. Charge applies. On request only. Two steps on entry to building. Apartment has 2 steps as well. Continental breakfast provided Apartment is cleaned after use Guests will be expected to put out their own rubbish, run dishwasher, and strip linen and put in bathroom. Filthy dirty apartment. Carpets and floor mats need deep cleaning, white towels with a brown tinge, tea towel disgusting, sticky benches and appliances. Stains on bed blankets. Would NEVER stay there again. Very sorry the apartment was not up to guests standard. Other guests very happy and we pride ourselves on quality and comfort. We didn’t hear about the problems until after the booking so had no chance to fix immediately. We love interacting with our guests to ensure a great experience. Have since fixed all issues including replacing the cleaner who let us down. Very happy with the results. Improved cleaning system overall and replaced linens. Offered credit for cleaning fee. Have multiple apartments all over central city offering modern living for a small family to larger groups of 8. 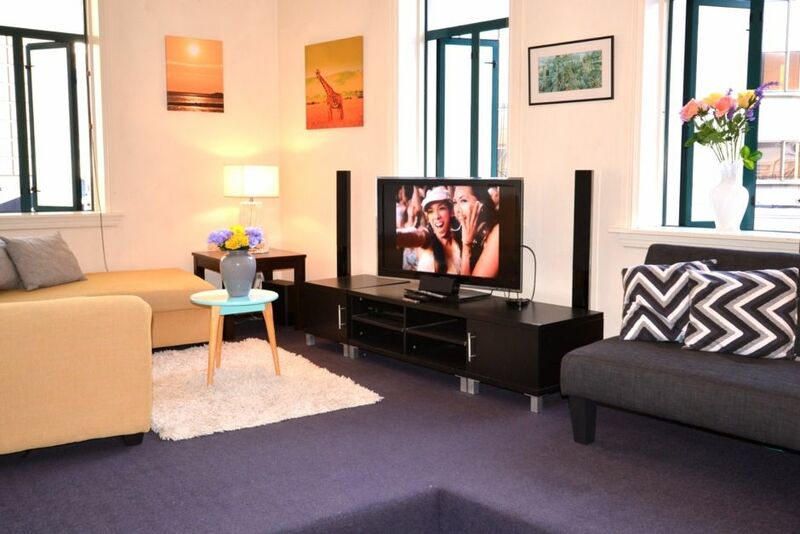 We enjoy presenting our apartments to guests and take pride in our positive feedback. Great welcome with a lot of recommendations on what to do it Wellington. Cute apartment, basically furnished but everything we needed for our stay. Great host to deal with - welcoming, informative and responsive. Thoroughly recommend the central location and Wellington as a destination for w weekend away!